Democrat (Term Expires: 2022) serving Philadelphia (part) County. Mem. Joint Select Committee on Election Issues, Gov Task Force on Voting Modernization, Firefighters and Emergency Services and Port Caucuses, Delaware River Basin Commission, Temple University Health System Episcopal Hospital, PATH (People Acting to Help), Empowerment Zone Board, Impact Services Corp, President's Advisory Council of the American Street Corridor Business Assoc, PenJerDel Steering Committee, and Ecumenical Hospitaller Order of St. John Knights of Malta. Former Chair of Dem. State Committee. 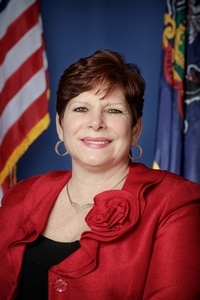 Recipient Firefighters Friend Award, John F. Kennedy Memorial Award, Working Woman of the Year Award by Coalition of Labor Union Women, Achievement Award from Concerned Black Leaders of Lower Tioga-Hunting Park, Fireman and Prison Guard Assoc of Phila and PHILAPOSH Woman of the Year, cited in Italian Americans of the 20th Century; Member of Senate 1995 to date; Minority Caucus Administrator 2009-2010; elected Minority Caucus Secretary 2011.